In the early days I left the irrigation pond largely alone. There was a route of sorts, but it was right around the back, well away from the water. The ground was scruffy and covered in fallen debris from the Eucalyptus trees. 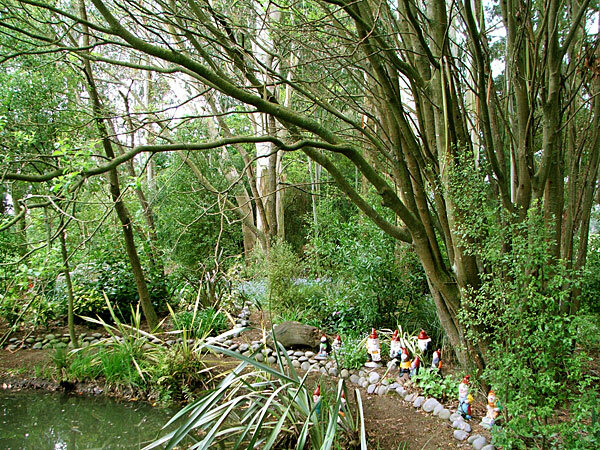 Self-sown Cotoneasters and species Phormiums dominated the water's edge, but it was impossible to get near them - unless by swimming across from the decking. On a country ladies' garden tour I had a revelation. 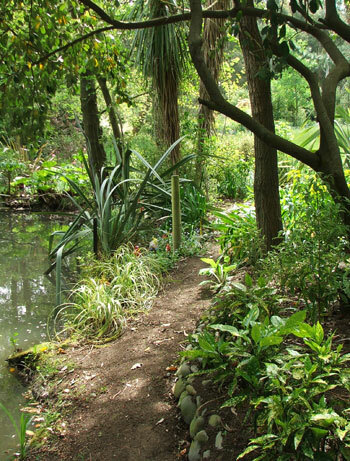 One of the gardens had a large country pond (like mine) in a grand shrubby setting (potentially like mine), but no path! As a visitor I was disappointed. The water was beckoning, and I wanted to walk around it. Lesson learnt! As soon as I got home I started work. The hardest thing was to persuade Non-Gardening Partner to chain-saw down some of the self-sown trees blocking the way around my pond. I was determined that he wouldn't wriggle out of it. Then I axed tree roots near the water to level out a waterside path, and built a small stone retaining wall. Now we were getting somewhere! A quarter of the water's edge was pathed to perfection, even with room for Carex trifidas and variegated Phormiums by the water's edge. The soil was poor (sandy and full of tree roots) and the nearby giant gum trees made conditions harsh, waterwise. My early visions of grand shubberies with rhododendron flower reflections in the water were short-lived (actually, the rhododendrons were almost just that). I had to settle for shrubs made of tougher stuff - golden leafed Choisyas, Rock lilies (Renga Renga), and bargain bin Aucubas - to plant next to the waterside path. Two little connecting paths now duck in from the original route around the back, which I've tided up and edged with river stones and mass Agapanthus plantings. I've made my usual mistake with one of these paths, planting two hybrid Phormiums far too close. Oops - they may need to be shifted sometime soon. And I've extended the waterside path, which now curves right around, passing close to Pond Cottage and its giant Alder tree. 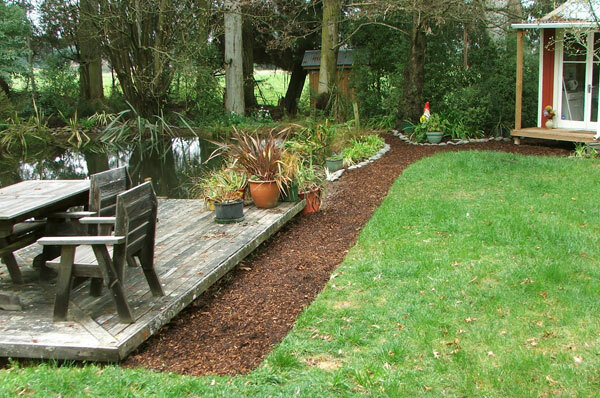 This part of the path is covered in shredded bark, and runs straight to the pond decking. A giant garden gnome stands in the Agapanthus at the junction under the Alder, surveying the pond. And that's exactly the final touch. 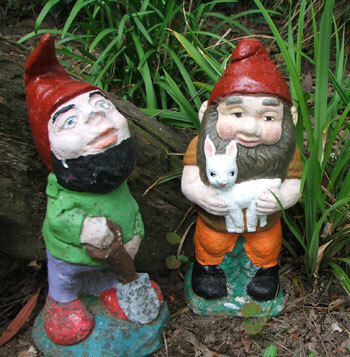 More garden gnomes have now taken up permanent residence alongside the Pond Path. People walking the path can stop and say hello (go on - it's fun).